Reflecting on the genealogy of Jesus helps us to remember that he is part of a human family and was raised with particular role models and inherited traditions. It also reminds us that many people helped prepare the way for the coming of the Savior, playing greater or lesser roles for the glory of the Father’s plan. Two people who are part of Jesus’ genealogy, but passed over in Scripture are the parents of the Blessed Mother, Sts. Joachim and Ann. We find evidence of Mary’s strength of character and trust in the Lord in Scripture, especially Luke chapter 1 verses 28-55 and John chapter 2: Mary is steadfast in making decisions, active in prayer, obedient to the laws of her faith, calm through moments of crisis, and devoted to her relatives. It is not hard to see how such models of parenthood would likely have inspired Mary’s own upbringing of Jesus. We can wonder how much of Mary’s unyielding belief through Jesus’ ministry, Passion, and Resurrection — especially after seeing her son publically brutalized and murdered — was instilled in her by the fortitude and strength she saw modeled by her own parents during her childhood. "How precious is the family as the privileged place for transmitting the faith! … How important it is to have intergenerational exchanges and dialogue, especially within the context of the family … Children and the elderly build the future of peoples: children because they lead history forward, the elderly because they transmit the experience and wisdom of their lives." The family is often the first community of love, knowledge, and faith that we experience (CCC 2205). It is a great gift to preserve and strengthen that takes our time, talent, and commitment to keep strong. Yet, just as each of our family members are imperfect, so too is our own love despite our best intentions. At times we may lose patience amidst the demands of life. Or, more tragically, we may find ourselves amongst family members who do not know how to love, perhaps products of their own troubled upbringings. When we face difficulties within our families, or see hurt in other intergenerational families, let us remember that regardless of our human relations, we have been born into the spiritual family of the Church. How wonderful it is that despite our earthly circumstances each of us has been entrusted to call God our Father, Mary our Mother, Joachim and Ann our grandparents and Jesus our Brother and Savior. Sts. Joachim and Ann, pray for us! Questions for Reflection: Who are the people in my family who have taught me the beauty of the faith? Which members of my family need me to show them the love of Christ? “It’s 11:11… make a wish!” Have you heard of that phrase before? I roll my eyes every time someone eagerly pauses in that moment, thinking that whatever they wish for will magically appear. Though superstitions like this detract from actual prayer, the idea of praying a daily devotion has a long history in the Church. Prayers like the Angelus, a Marian devotion that commemorates the Incarnation, have been around since at least the Middle Ages. Often prayed at noon, the devotional provides the faithful with an opportunity to re-focus and recommit their days to Christ. Marian devotions in particular can help us grow closer to Christ because Christ himself dedicated Mary to us after his death. When Jesus said, “Woman, behold your son. Son, behold your Mother,” he was providing Mary as an intercessor for us. After Jesus’ death, the Acts of the Apostles records her as being present when the disciples gathered at Jesus’ Ascension and then later in the Upper Room during the Descent of the Holy Spirit. Because of Mary’s continual intercession for the followers of her Son and because of her role serving with the Apostles on earth, she has historically been known as the Queen of Apostles. As tradition goes, it is Mary who bolstered the Apostles in moments of discouragement and fear after the death and Resurrection of Christ. Prayers to Our Blessed Mother never go unanswered. As a personal devotion to her, I offer up a Hail Mary for my vocation every time I see an 11 on the clock. I like to pray when I see the number in order to turn the superstitious ‘11:11 practice’ into something for the glory of God; you could pray when you first wake up, or at noon like those who pray the Angelus, or during your commute to work or school. Daily devotions are flexible! The important part is to make sure that you are checking in with our Heavenly Father every day. In particular, praying with Mary encourages us to adopt as our own her obedience and love for the Father. And of course, Mary is never outdone in generosity, and her intercession to Jesus is the most powerful of all. I encourage you to begin a daily devotion of your own. It can be for your vocation, for a personal trial, for someone else – for whatever is on your heart that day. My prayer for my vocation was inspired by a friend who made a daily offering of prayer for her future husband and is now married and has four beautiful babies. She told me her life wasn’t always pointed straight to God’s will, and how she grew up neglecting her Catholic faith. As she grew older, she knew that her soul was yearning for something to grasp, to hold onto, to fill the void in her heart. She decided to go to adoration, and was inspired through prayer to begin a daily devotion to Christ through Mary. That devotion she made fifteen years ago to Our Mother changed her heart and her life. I pray that you also will be inspired to take up a daily devotion to Our Mother, who so graciously hears our intercessions and carries them to her son. As I pray each day this devotion, I will pray for you, and this journey to Heaven that we are taking together. Question for Reflection: What do my daily devotions look like? What is an easy moment in the day that I can take some time to pray to Our Mother for guidance and intercession? Kathleen O’Reilly is a senior at Saint Vincent College in Latrobe, Pennsylvania. "This encouragement to holiness is renewed and takes on particular resonance – we love to repeat it – in this year of the Council, it highlights the note of holiness and apostolate of the church." And so began the Discorso della Luna, or “Moonlight Speech” by Pope St. John XXIII. Earlier that day, he opened the Second Vatican Council. Knowing he needed inspiration, this humble Bishop of Rome looked to another simple priest of Rome, St. Vincent Pallotti. The spirit of Saint Vincent Pallotti can be seen throughout the Council and the work of the council. Pope St. John XXIII shared St. Vincent's vision that we are all called to holiness – that the universal call to holiness is open to the laity too, not just priests and bishops. He had a vision that Christ’s love needs to be accessible to all believers. Pope St. John XXIII demanded that the Church teach that Christ came for all! The concept of the universal call to holiness was written into multiple documents of the council, such as Lumen Gentium. The title “Mary, Queen of Apostles” was one that was revived by St. Vincent Pallotti. This was an ancient title that had fallen out of use. During his ministry, St. Vincent Pallotti invoked this title to demonstrate that all were in the Upper Room, not just the twelve apostles. 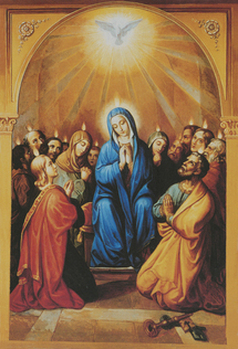 He had a portrait commissioned showing the number of woman and men at the moment of Pentecost. Like the symbolism behind the painting suggests, Apostolicam Actuositatem forever enshrined the notion that all people are called to be apostles of Christ. This document had two main writers: Fr. William Mohler, S.A.C. Rector General of the Pallottine Fathers and Brothers and the youngest bishop in attendance, Karol Wojtyla. Fr. Mohler and the future Pope St. John Paul II wrote into this document the shared vision of two humble priests John XXIII and Vincent Pallotti. We must follow these examples in our lives. Let us strive to bring the gospel to all, just as St. John XXIII and St. Vincent Pallotti did.